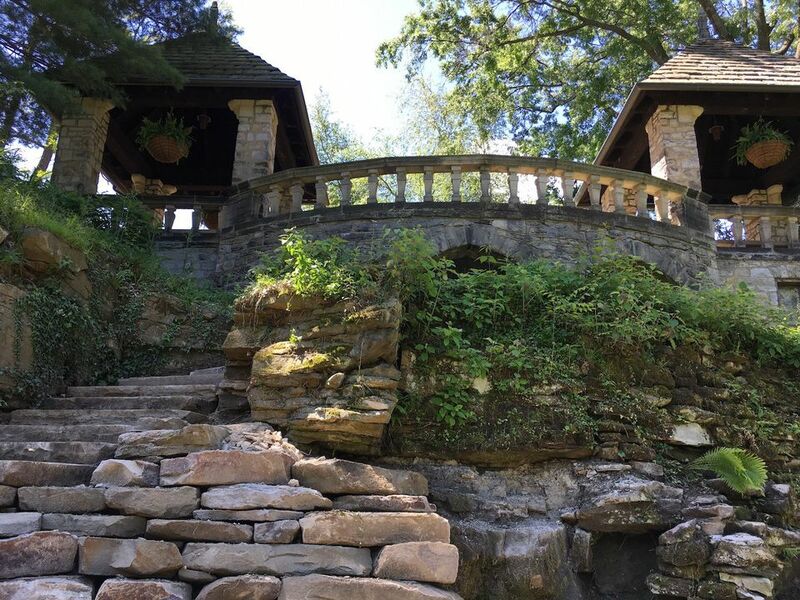 AKRON — A restoration project to shore up nearly 800 feet of rocky cliff at Stan Hywet Hall & Gardens will open a vista that's been closed off for more than 15 years. Vistas offering picturesque views have been features of the Tudor estate's celebrated landscape since it was designed by Warren Manning a little over a century ago. The former home of Goodyear Tire & Rubber Co. co-founder F.A. Seiberling, Stan Hywet Hall is Akron's most distinguished National Historic Landmark. Restoration around the estate has been underway since the Second Century capital campaign ended in 2015, raising more then $6 million. Now, a large part of the work is rebuilding stone structures originally mined from an on-site quarry. Local craftsmen from C.O.I. Stonework are employing dry masonry, an ancient technique using only stone and gravity, to reconstruct many of the century-old stone structures. In May, C.O.I. 's president Zach Goebelt, a certified journeyman mason, received a Celebration of Preservation craftsmanship award from the American Institute of Architecture - Cleveland chapter, and the Cleveland Restoration Society for rebuilding Stan Hywet's 2,200-foot perimeter wall. C.O.I. is now rebuilding the cliff and stairways under the estate's Tea Gardens, a favorite spot for weddings. Once the cliff is restored, a closed stone patio built at the north-west corner of the cliff will be repaired and reopened to the public. Visitors will once again be able to look out across the lagoon deep into the Cuyahoga Valley National Park. "I love to think of John Seiberling standing up there thinking 'Maybe I can save all this,'" said architect Marc Gilles, Stan Hywet's director of historic structures. Seiberling, a U.S. congressman and grandson of F.A. Seiberling, is credited with working to preserve the Cuyahoga Valley, which through his efforts became the Cuyahoga Valley National Park. The work also includes restoring what the bath house below the Tea Houses next to the lagoon, which feature two changing rooms. The work will enable reconstruction of the Tea Houses fountain as well. "My goal has been to get it all back to the way it was when the Seiberlings lived here," said Gilles, who's headed up historic preservation efforts since 1996. The stone restoration will go on throughout the summer. To see the work, visit Stan Hywet from Tuesday through Sunday, 10 a.m.- 4:30 p.m. at 714 N. Portage Path. Visit the website for tour information.